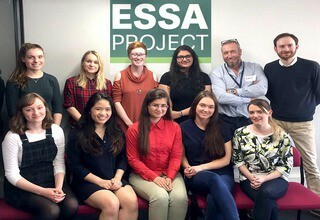 The first cohort of students from the University of Ediburgh completed the training to support the first audit of the ‘European Students Sustainability Auditing’ (ESSA) Project. The training provided students with knowledge of the University Social Responsibility (USR) Benchmark Standards and initiatives, audit and research methods. Students also discussed approaches to support visiting student auditors from Kaunas University of Technology and the University of Porto, who would audit the University in April. The ESSA Project aims to audit the social responsibility performance of participating universities over a three-year period. The University of Edinburgh works in partnership with the Edinburgh University Students’ Association to deliver this project. By using a group of trained facilitators, a cohort of 60 students drawn from participating universities will be trained as Social Responsibility Auditors in a student-centred programme, delivered in blended mode. This will culminate in four cross-national audits of different education institutions in the European Higher Education Area. Students from the University will audit Kaunas University of Technology in October 2017.